The Ramos Fizz—or “Ramos Gin Fizz,” as Huey Long called his favorite drink—is one of New Orleans’s most famous cocktails. And it’s all about the texture achieved by long shaking. Henry “Carl” Ramos insisted that his fizz be shaken (and shaken and shaken) to reach the proper milky consistency. It’s hard to believe that any bartender could afford to shake for the purported fifteen minutes in a commercial setting, but it’s well-documented that during the drink’s pre-Prohibition heyday, bars would hire extra “shaker boys” in an effort to achieve just the right texture and body. Jerry Thomas first recorded the basic “gin fiz” template in the appendix of the 1876 edition of his Bar-Tenders Guide . It was a simple gin sour with a splash of seltzer, very similar to the Tom Collins. Ramos first served his namesake drink in 1888, but the Ramos Fizz is a far cry from the simplicity of the original. A popular exercise in the late nineteenth century was adding milk, cream, or egg (whites, yolks, or both) to cocktails and sours to change their texture, and texture seems to be what the Ramos Fizz is all about. In the traditional parlance of the day, customers could order, for example, a Cream Fiz, a Silver Fiz (with eggwhite), or perhaps a Diamond Fiz, topped up with champagne (and known for most of the past century as the French 75.) 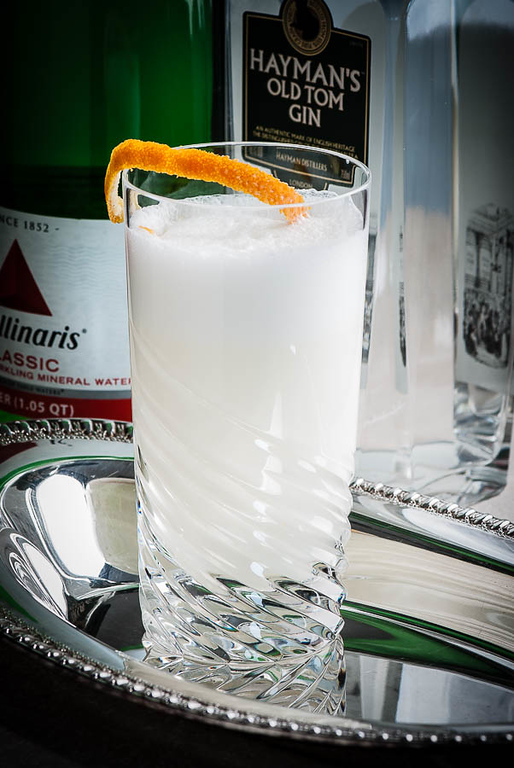 Ramos decided to gild the lily by combining both eggwhite and cream into his version of the Gin Fiz; and, with a typical New Orleans flourish, he topped it off with a dash of orange flower water. The Ramos Fizz was born. We’re lucky to have the recipe — Ramos kept the formula a secret for decades; Prohibition seems to have convinced him to share his creation, perhaps from fear that it would be lost to posterity. Meanwhile, Harry McElhone published a nearly identical recipe called the “New Orleans Gin Fizz” in his 1927 Barflies and Cocktails; Harry Craddock picked that one up in 1930 for The Savoy Cocktail Book . “Dry shake” (no ice) all ingredients—including the water—for two minutes. Add ice, and shake for an additional two minutes, more if you can, or until you can’t stand to shake anymore. Strain into a tall tumbler or Collins glass. Optionally, garnish with a wheel of orange. Choose a gin that is not too juniper-heavy; sweeter gins are preferable. Ramos’s original recipe called for Old Tom; Plymouth is a pleasant alternative. The thick richness of the proper cream is one of your best tools in achieving Ramos’s “good rich milk” consistency. Heavy cream is preferable to half-and-half. Low-fat and no-fat dairy just don’t work in this drink. Orange flower water is the hallmark of this drink, and this is a case where there is no substitute. Without it, the drink you make is not a proper Ramos Fizz. So how long do you shake a Ramos Fizz? Don’t tell anyone, but I really did shake that Ramos Fizz for fifteen minutes. I can tell you that you don’t really need to shake the Ramos Fizz for fifteen minutes. Or even for ten. I recommend a “dry shake,” with no ice, for about two minutes, then a shake with ice for a minimum of two more minutes—a total of four minutes shaking. What I learned from the fifteen-minute shake (and from eight- and ten-minute shakes) is that no magical transformation happens after a special number of minutes; each minute of shaking provides only incremental improvement in texture. A longer shake will always get you closer to Ramos’s “good rich milk”—and that is a gorgeous drink—but you’re most of the way there after four or five minutes. Labor intensive and time-consuming to prepare, you’ll rarely find a bartender eager to prepare a Ramos Fizz. You’ll have to make it yourself, and it will be work, but it’s a delightful confection, and well worth the effort. And it doesn’t take fifteen minutes. “The Ramos Fizz” at cold-glass.com : All text and photos © 2013 Douglas M. Ford. All rights reserved. I am a big fan of cocktails with egg white and The Ramos Fizz sounds absolutely great. What you think about Clover Club? Clover Club and Royal Clover Club are my favorites now. The Clover Club has been on my list of “drinks to try” for a very long time, but other drinks keep slipping in ahead of it. Now you’ve renewed my interest, and I’ll be making one soon. Thanks! Make sure you do the Clover Club with an old school raspberry syrup and not a newer grenadine (which makes for a lame version of the drink) recipe. Also, I imagine that if you were hungover and waiting for a Ramos to cure you on a Sunday morning, it would seem like 15 minutes. We love the Ramos Fizz in this household. Rather than doing the ten-minute shake (or even the dry shake), though, I use one of those milk frother wands for a minute or two before adding ice and shaking. As far as I can tell, that nicely duplicates the effect of the long shake, and it’s much quicker and easier. Here’s a question for you. Do you know how Ramos should be pronounced? Is it a Spanish-style “a” (as in “nachos”) or an Americanized long-“a”? I’ve occasionally pondered those frothers, and shaking (and shaking and shaking) Ramos Fizzes got me to wondering about them again. Now I know. Thanks! I had that same blender experience, Doug! The Butter Fizz turned out not to be very enjoyable. The frother — a much more gentle device — was suggested to me by one of the bartenders at the Westin St. Francis in San Francisco (right before he used one to make a superb Ramos Fizz). You just sold a frother. Thanks! I admire your dedication in testing the times. When I did this drink, I went for 6, but man, my hands were freezing. I also learnt: 1. Don’t overdose the orange flower water. 2. Tanqueray doesn’t work. As for pronunciation, I got into an argument with my bartender about this last weekend. He insisted on Rah-mos, which is the most logical, but when I researched it, I was pretty sure it was Ray-mos. Anyway, it’s a really nice drink (and a nice way to piss off a bartender. Shaking the Ramos Fizz will give you frostbite, that’s for sure. I had to start wrapping the shaker in a towel to survive. Apparently, the Ramos Fizz was President Benjamin Harrison’s favorite drink, according to the bartender at the Willard Hotel in Washington, D.C. It was discussed in an article in the Washington Post: http://www.washingtonpost.com/blogs/going-out-guide/post/go-drinking-with-past-presidents-at-the-willard/2013/01/11/6723c1d4-5c1c-11e2-9fa9-5fbdc9530eb9_blog.html. If this was Harrison’s favorite drink, he certainly was aware of fashion—the Ramos Fizz would have been brand new as he came into office. Good for him! The other interesting thing in that link is that apparently the Willard Hotel claims the first soda fountain in DC. These things are important! certainly going to be trying this out, thanks Doug. Aah, it looks tasty! :-P! Oh, it is tasty! Thanks for finding Cold Glass. What about getting 15 friends to shake a minute each ? Love it! I’ve tried making a Tom Collins before but this recipe is new to me. Not sure if I’ll go for the full 15 minutes though. Settle for 5 minutes. It’ll be fine. And as noted above, perhaps you can find a friend to help shake it. And yes, the natural inclination is to stop shaking when your hands get too cold. You could invent a machine that reduces the time and simulates the same motions. The Ramos Fizz, what memories it brings back. It used to be my New Years Day, official drink. I just copied your recipe, and can’t wait to try it. wow, never read such a complete history on a cocktail before. gives me something to think about for my next fizz so thanks! I’m delighted that you enjoyed the article. Just wanted to offer thanks on a new gin protocol to add to my ‘I’m out of tonic water’ collection! Also, two-penny thoughts on the pronunciation – having grown up inside the border of the NOLA patois, I’d wager that RAY-mus would be a common (if not correct) pronunciation. Cheers! That’s an interesting insight about the pronunciation, thanks! I’ve tried this one before but I couldn’t make it perfectly. :-) Thanks for sharing your version. I will definitely try this out! BTW. Congrats for being on FP. I enjoyed stopping by your blog! Thank you, it’s fun when Freshly Pressed brings new friends. You’re welcome. I am now following you! This sounds exhausting. I’m a little concerned about trying to drink it with a jelly arm after all that shaking but does sound like one to try on a 4-5 min regime. Thanks for all your ‘testing’. The long shake is exhausting for sure—”jelly arm,” that’s a good description, and it doesn’t do much for the back and shoulders, either. The 4-5 minute shake is just fine. The Ramos Fizz is my favorite brunch drink. I first tried it twenty years ago in Lake Tahoe, California. But now I can’t get a bartender in California to make one because of the raw egg. Even the promise of a big tip doesn’t seem to help. I see the bartenders’s point—they have to protect their business, and if they don’t trust their egg supply, they can’t put themselves on the line with raw egg. I guess that’s one of the good things about making these drinks at home—you can use ingredients as you see fit. One of the things I like about Minnesota is that the egg supply seems to be very low risk so far, and I can use egg in these classic drinks fearlessly. Very nice post man! Well, we appreciate everything that involves booze, but nevertheless it was very nice to read! Cheers! Thank you, and cheers to you! The Ramos Gin Fizz was by far my favorite, though the Hurricane and Cafe Brulot were close behind! A very interesting list—sort of like a survey class in college! Congratulations to you for working your way through. Cafe Brulot: There’s one to add to my to-do list. This is a wonderful, wonderful post. It makes me want to return to New Orleans so badly. You reminded me of sitting at Muriel’s, waiting for my first Ramos Gin Fizz, feeling adventurous. I. Loved. It. Other great drinks I’ve had are French75’s “French 75s” or a Napoleon Houses’ “Pimm’s Cup”… or Bayona’s “Stormy Morning”… or a Commander’s “Whiskey Smash” … the Ritz’ “Papa Doble”… a g&t at the Spotted Cat… I’ve left out a bunch others, there are so many great 1920s classic options. I love that you did the scientific (and culinary) experiments for us, too! And I’m glad it doesn’t require a full 15 minutes, either!! My friend will be in New Orleans in a few days. Maybe she should try it in situ, as it were? Say this article the other day and thought it might be of interest? She should definitely try one, if she can find a place that makes a good one. As for the Blue Blazer: I’ll probably try that one of these days. The problem, of course, is that my house is flammable. Whiskey, fire, showing off… what could go wrong? As part of my blog is about beekeeping, I came across this one as well. Heard of it? I had not encountered the Black Bee. It’s intriguing; I’ll have to give it a try. Every New Year’s day, my parents trundled the family off in our green buick station wagon to visit family friends. I spent a hateful day playing with kids I hardly knew while my Dad and his friend played with perfecting the Ramos gin fizz using a waring blender – to the delight of all the grown-ups. This was in the ’50s and orange flower water was an exotic ingredient, obtainable only through the clinic pharmacy where he worked. I suspect the fizzes got better as the day wore on and that we had a shaky ride back home. It’s New Year’s day today and I used a good ol’ fashioned shaker. Your recipe is perfect! Thanks, Bob. Yes, I can imagine that the fizzes would get much “better” as the day progressed. I still haven’t been able to get one right in the blender. Happy New Year! I worked with a bartender who used the spring from his strainer for all his egg white drinks. He put it in the shaker for the dry shake. I’ve heard of adding agitators like that into the dry shake, but never tried it. How did that work for the person you worked with? I now know exactly what I’m going to do with my Froth Au Lait Gourmet™ on new years day. Batch frothing Ramos Gin Fizz’s! Hello Doug, did you hear about the “reverse dry-shake” method by Aristotelis Papadopoulos? Lou Bustamante talks about it in his manual. Hello Doug, combine all of your ingredients in a shaker without ice and dry-shake. Add ice and shake. Strain the drink (Boston shaker glass), dump the ice, and shake again. Then pour your drink through a fine strainer to catch any curdled egg and the chalaza. I’ll try it. It will be interesting to see how the result is different. Thanks.